The fourth edition of the EARTO Policy Event was held on 11 October 2017, 14.45-18.30, at the BIP Info Place in Brussels. The event gathered representatives from RTOs, EU institutions, industry as well as other key R&I stakeholders. 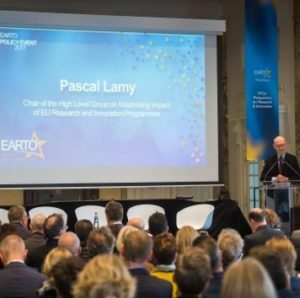 The programme featured a keynote speech by Pascal Lamy, Chair of the High-Level Group on Maximising Impact of EU R&I Programmes, and two high-level panel discussions with key representatives from RTOs, EU institutions and industry.